One former Manchester United star couldn’t resist mocking another after England’s World Cup quarter-final win over Sweden today. 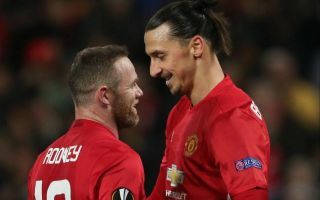 Wayne Rooney and Zlatan Ibrahimovic may have only played together for one season at Old Trafford, but both remain much loved by United fans for their different but important impact at the club. Clearly still in touch from their Red Devils days, Rooney tweeted Ibrahimovic after England beat Sweden to make it to the World Cup semi-finals. The forward, now with MLS side DC United, jokingly offered to console the Swede if he as feeling a bit down about the result. How you feeling today mate @Ibra_official? If you need a chat I’m always here ? Both were big players for their countries back in the day, but are now past their peak and no longer playing at international level. They will have been following today closely, however, with England against Sweden always an intriguing and even match, though it was the Three Lions who won this time in what will go down as a memorable result.